HF: Thomas Sposato has kindly sent information about possibly one of the most luxurious boats ever built in Hong Kong – the 65-foot Carolyn Quincy. Thomas is the son of one of the boat’s previous owners. 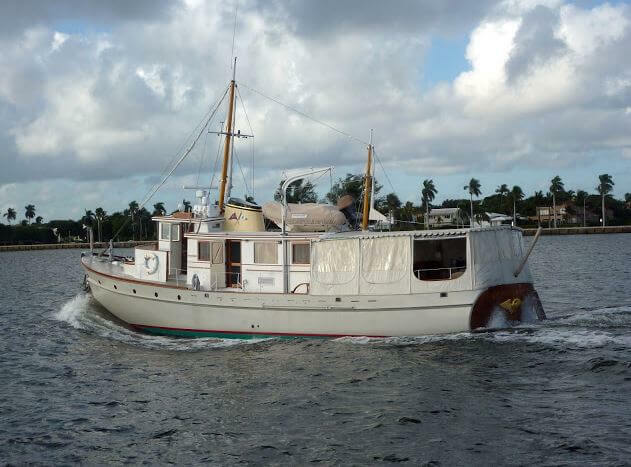 It was custom built in 1963 by American Marine Ltd boatyard at Junk Bay, which was run by Robert J Newton and his sons John and Whit. Father and sons built heavy, wooden, sailboats and big motor yachts, to designs by the world’s top marine architects – Sparkman & Stevens, William Garden, Nat Herreshoff, Ray Hunt and others. In 1974 a new factory was opened in Singapore and they changed to making their craft out of fibreglass. Carolyn Quincy was made to the order of a wealthy American, Philip L Van Every, who was Chief Executive of Lance Inc. and Mayor of Charlotte, North Carolina. Carolyn was one of Van Every’s four daughters. With a mahogany and teak hull, a deep freeze, water distillation plant, electric -powered lavatories and carpeted lounge, the launch was powered by two diesel engines and could cruise at 10½ knots. It was designed by Walter J McInnis of Eldredge-McInnis, Inc. Boston, Massachusetts. He maintained the firm and continued a very active design practice until his retirement in 1976 at the age of 83. 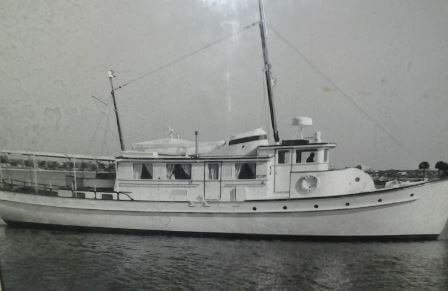 Every owned the boat fom 1963 to 1968 when its name was changed to the Francis Marion. It was then sold to Anthony J Sposato. The bent port shaft was was repaired in 1977. In 1980 a Cal-Rod heater was added and a bow plate for the anchor in the 1980s. And later larger steadying sails and a washer and dryer. A 13′ Boston Whaler was her tender until 1980, then replaced by a 10′ antique lapstrake Inboard Captain Tender, and then changed again in 1995 to a 14′ inflatable. The Francis Marion was later donated by Michael Phillips, who owned the boat from 2000 to 2014, to Mystic Seaport, Connecticut, USA. Restoration work was done from 2000 to 2003.
i just saw this vessel at Mystic seaport. What is the name and manufacturer of the current HULL COLOR? it is a very light grey- green.